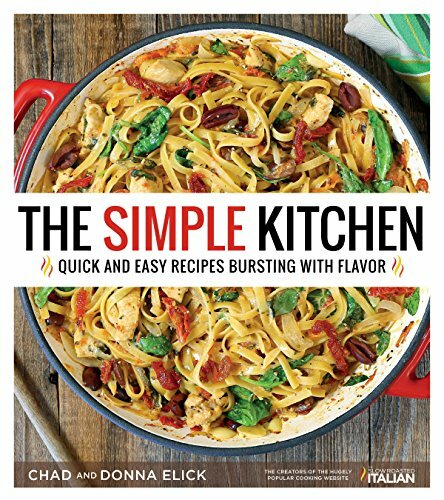 The Simple Kitchen provides a definitive answer to the question, “what’s for dinner?” with exceptional recipes for everyday meals. In this life-saving family cookbook, you’re provided with more than 80 delicious recipes that come together in no time and that the whole family will love. Whether you want a hands-off approach (Perfectly Slow-Cooked), only have 30 minutes (Dinner in a Snap! ), don’t want to clean dishes all night (One-Pot Wonders) or have guests to entertain (Simple Appetizers), you’ll find everything you need to get in, get out and get living. Recipes include Fiesta Chicken Street Tacos, Meatball Parmesan Skillet, Slow Cooker Sweet and Spicy Barbecue Wings, Garlic-Parmesan Smashed Potatoes, Overnight Cinnamon Rolls and many more. Tasty family dinners never looked so good―or easy!